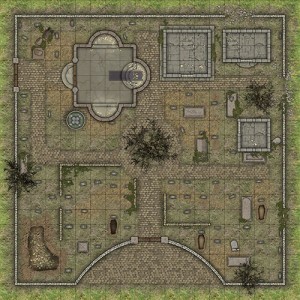 Heroic Maps has released their new Cemetary gaming maps in both day and night versions. We're proud to announce the release of our newest RPG battlemap - Cemetery! Cemetery is a printable dungeon floorplan compatible with any RPG/Dungeon-Crawl game. It can be used as a standalone gameboard, or combined with any same-scale tileset. Cemetery features a large cemetery, replete with features such as a chapel, fallen statues, dead trees, tombs, graves and bone pits.The map is provided in both Day and Night versions. Also included is a set of secret stairs - hidden in graves and tombs. Plus - a FREE pack is included with this map. Cemetery Crypts features 3 dark crypts that can be used on their own, or as locations beneath the cemetery.